Last week, Akira filled the Lyric Opera house with whose who of Chicago to get a preview of what the fashionistas of Chicago will be wearing this spring. 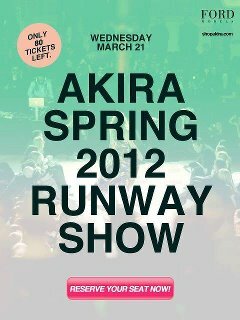 All looks will be available in stores and Shop Akira. The zig zag runway brought out media and shoppers alike to look at the many stories Akira had to share this season in their annual spring show called Valley of the Castles. 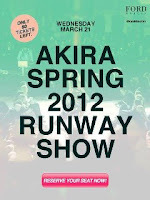 PrivyDoll had seats ready to scope out the latest trends from Chicago's retail megahouse, Akira. Opening the show was Erin Martin, a local who happens to be on The Voice who preformed a brand new song. Guarded doors that opened up to the runway were released and models in spring tones appeared. The biggest trends of the season: chiffons, pastels and girly prints. Jumpsuits and sheer looks also made it into many of the looks. The men were not left out on this cat walk. Men sporting boat shoes and colored sole shoes rocked the runway with preppy looks. Colored shorts and stripe sweaters were in the majority of the looks for spring. A fashion show for mens would not be complete without a series of shirtless models rocking swim trunks. Accessory: armor. Clearly, their abs and shields will scare off any straight girl.